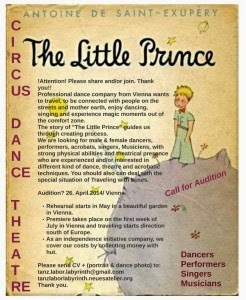 We are looking for male & female dancers, performers, acrobats, singers, musicians, with strong physical abilities and theatrical presence who are experienced and/or interested in different kind of dance, theatre and acrobatic techniques. You should also be able to deal with the special situation of Traveling with buses. Professional dance company Tanz.Labor.Labyrinth based on Vienna is creating new piece “The little Prince”. Through this new creation of us, we travel and aim to be connected with people on the streets and mother earth, enjoy dancing, singing and experience magic moments out of the comfort zone. The story of “The Little Prince” guides us through creating process. Rehearsal starts in May in a beautiful garden in Vienna. We organize your accommodation in Vienna but your travel costs will not be covered for rehearsing. Premiere takes place on the first week of July in Vienna and traveling starts direction south coast of Europe. As an independence initiative company, we cover our costs by collecting money with hut. further informations of Audition will be informed to all applicants in following days. Thank you very much for your attention. All team are looking forward to seeing you all.